I've always been an enormous fan of souvenir tat. Wherever I go in the world, I always find some little memento that reminds me of my trip (a tip for all you tat fans: Washington DC is the best city in the world for souvenirs). Sadly, my tat is not appreciated by those closest to me and is now relegated to a cupboard. When I close the door of that cupboard, eight snow globes from various American cities emit a baleful note or two, just to remind me they are there, including the one I bought in Texas that has a big yellow rose inside it but plays the music from the BBC's snooker coverage. The house has 16 sides, allowing the sun to shine into different rooms at different times of the day. Originally, the sun would have risen in the cousins' bedrooms, before the light moved into the drawing room and then the dining room in time for dinner. What a GENIUS idea. When you think of all those people on Grand Designs building big hangar-shaped blocks - ROUND IS THE ANSWER. At the centre of the house is the Octagon, a room where the cousins could entertain their guests. 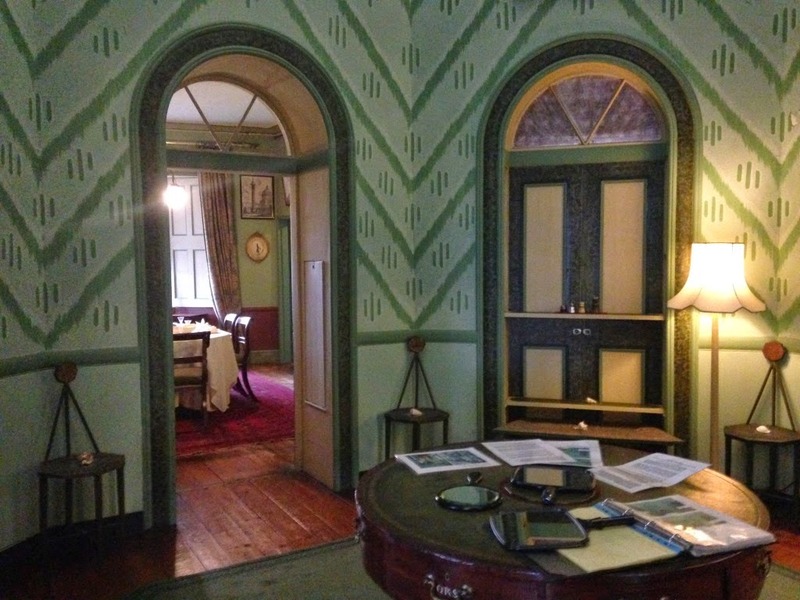 A number of other rooms lead onto the Octagon - the Study and Music Room were originally the cousins' bedrooms. It was very hard to take good photos inside but this is the view from the Octagon through to the dining room - it gives you some idea at least. 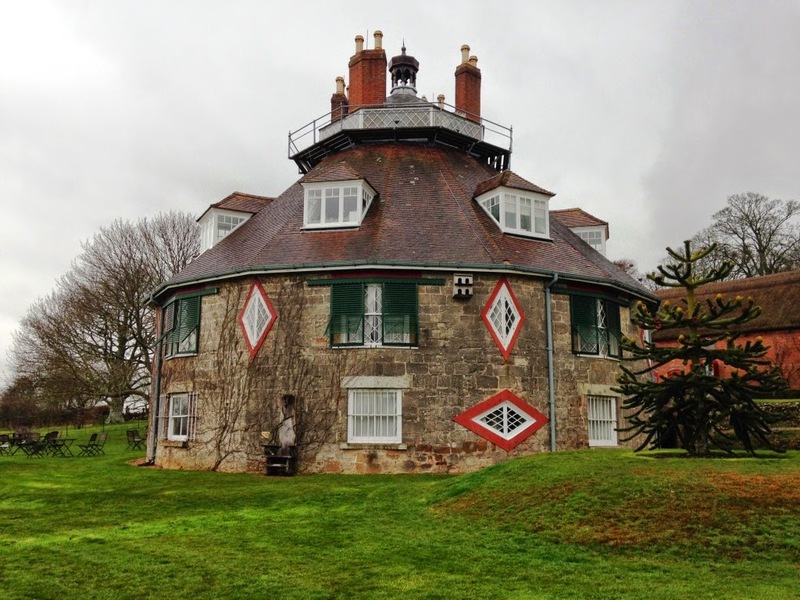 A la Ronde is famous for its Shell Gallery at the top of the house. It is closed to visitors but you can see bits of it thanks to screens and mirrors. The Parminters used glass, pottery, and stones to supplement the shells in creating beautiful decorations. The ownership of the house has had some interesting twists and turns. When Mary died in 1849, she stipulated that the property could only be passed to unmarried female relatives, which was initially followed. Then it somehow ended up with the Reverend Oswald Reichel, whose widow tried to sell it to a developer, but a relative called Margaret Tudor bought it and opened it to the public in 1935. The National Trust acquired it in 1991. Because it was pretty much kept in the family, the furnishings and trinkets belong to the place. And although not everything is exactly as the Parminters had it, you still get a real sense of how harmonious it must have been to live in a round house full of beautiful pictures and treasures in a beautiful setting. It's a remarkable place. 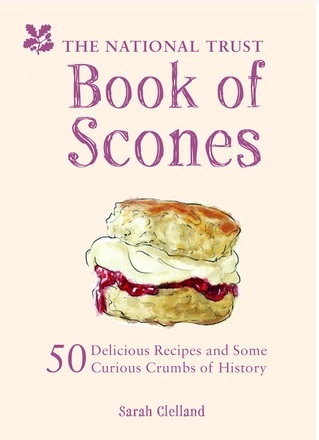 But let's move on to the scones. 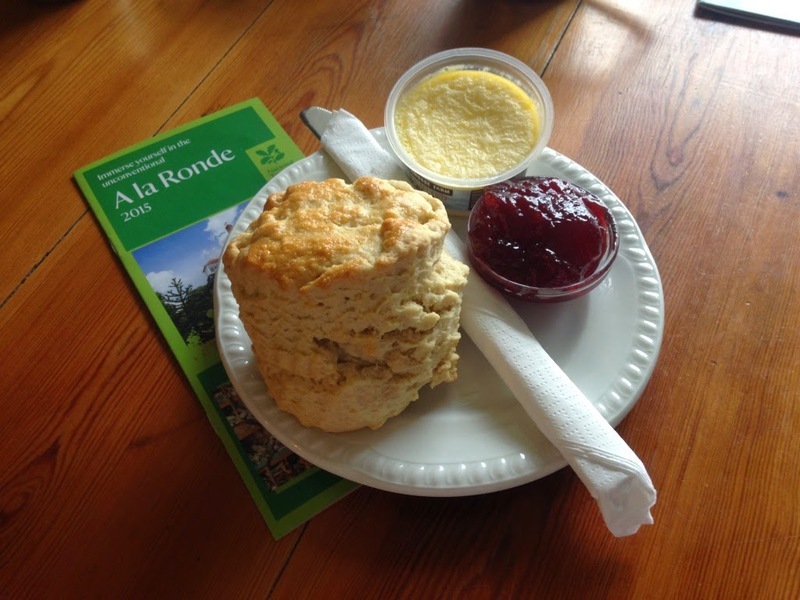 A la Ronde was the 70th stop on the National Trust Scone Odyssey. 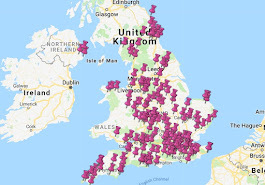 Yes, that's right - I have somehow managed to visit 70 National Trust properties and trough my way through at least one scone in nearly all of them. The one thing that every scone trip has in common is The Moment Of Terror. It never goes away. You can walk into a tea room as nonchalantly as you like but that flash of panic that there might not be any scones is always there. The Moment Of Terror varies in severity and today's rating was HIGH. It was my 70th mission, I had travelled 160 miles, it was raining, I was soaked, and I got lost. I was expecting A la Ronde to serve octagonal scones but by the time I got there I didn't care if the scones were in the shape of Jeremy Clarkson as long as they had some. It was the tastiest scone I have had in a long time. This being Devon, the cream was turbo-charged - it was very thick and less sweet, which I loved, but it did present a challenge to the scone. However, I ate all of it and if I did end up walking around with jam smeared all over my face, nobody said anything. So that's 70 National Trust scone adventures done - only 150 odd to go. What a crazy looking place, I lived in Exeter for 5 years, had no idea that was there! Question: if the house was built so the sun shone in each room in succession...what time of year was it best to have dinner? (it's like one of those maths puzzle things...). Because the sun sort of..moves throughout the year..? I've reviewed the cream tea here this week and have to say that the scones are amongst the thickest, shortbreadiest, deliciousest in Devon!